Tanking or structural waterproofing refers to the prevention of damp in underground walls and floors. Tanking is commonly required in any cellar conversion as well as in basement flats, where some or all of the walls may be below ground level and affected by damp. If your property requires structural waterproofing, you will need the best expert advice, as the specific method of waterproofing and the means of application will depend on the structure of the property and the surrounding conditions. For example, if there is likely to be water gathering behind the tanking, we will recommend the installation of a pump to remove excess water and prevent any damage to the building structure. Our trained surveyors are qualified to CSSW standard and work to BS8102 – the British Standard Code of Practice for Protection of Below Ground Structures against water from the ground – which provides guidance on preventing the entry of water into below ground structures. 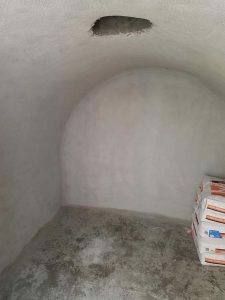 There are several methods of structural waterproofing, the most common being cementitious render systems and cavity drain membrane (CDM) systems. Our surveyor will determine the best solution for your property, following a comprehensive assessment of the structural and environmental conditions, as well as any specific requirements you may have for the underground structure. We will provide a fully priced breakdown of the specifications for the appropriate solution in your property, together with alternative methods, if appropriate. RLH Developments are experts in the installation of both cementitious and cavity drain membrane systems. We will apply a waterproof membrane, cementitious or painted-on coating to the walls and our team of expert plasterers can then apply specialist plasters on top of the chosen waterproof barrier.